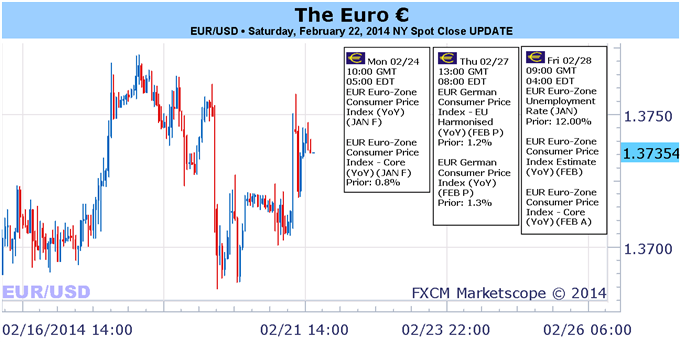 The Dow Jones FXCM Dollar Index (ticker = USDollar) rose every day of the past trading week. We haven’t seen a five consecutive day advance from this benchmark since the run through November 1 – notably the beginning of an impressive bull run for the greenback. Yet, there is something still distinctly absent from the dollar in this turn: conviction. Momentum on this rebound is just as tepid as it was in the 10-day slump that preceded it. So long as the Taper isn’t put on hold or the market isn’t struck by a renewed appetite for expensive ‘risk’ assets, the dollar may be left to drift higher. But if the currency wants to truly rally, traders may need to be inspired by recognition of the Fed’s first rate hike or a S&P 500 collapse below 1,800. In assessing the dollar’s fundamental bearings, there are two major themes that seem to be capable of taking the rudder over for extended periods: Fed monetary policy speculation and general risk trends. Between the two, investor appetite has the ability to be the most explosive and thereby influential. It’s no coincidence that the USDollar began its turn when the S&P 500 – a benchmark for investor sentiment – stalled below 1,850. Yet, the halt below record high resistance for the stock index didn’t naturally segue into the long overdue reversal. With the equity market effigy holding just below its all-time highs into the week’s open, it is more likely that we see an upside breakout for stocks and a pang of disinterest for the USD. Yet, the potential for risk trends is asymmetrical. While probability favors a buildup of risk exposure after a five-year bull trend, the follow through is growing increasingly difficult to muster as participation flags and exposure (leverage and relative high-yield interest) hits record levels. In contrast, fewer traders and greater sensitivity via geared positions marks the kind of conditions that can evolve into a disorderly rush for the exits. A great visualization of this is equity (VIX) or FX-based (FX VIX) volatility index. There is very little risk premium (1.5-3.0 ‘vols’) left before we hit natural / record lows. The correlation between USDollar and the FX VIX is an exceptional 0.83. The threshold to turn complacency and the grab for yield off pace and ultimately send market participants scrambling is proving exceptionally high. We need something that overrides confidence in a stimulus-protected world. Emerging Markets proved the most provocative threat we’ve seen in some time earlier this month. Yet, the contagion eased before it hit critical mass. We shouldn’t, however, write the risk off though. There is plenty of EM-based event risk this week and the G20 is unlikely to tender a meaningful policy to safeguard the group from its excesses. In reality, the turn in sentiment will likely evolve out of extreme positioning and necessary market rebalancing that inspires fear, but a catalyst is what traders remain on the lookout for. As it happens, a primary source of the confidence build up to this point will also prove a point of anxiety going forward. The FOMC has already Tapered its QE3 program twice so far, and the impact seems tepid. Yet, this is an underlying current that will build momentum and influence. When the turn is made, there will be plenty of fuel to burn. Assessing the outlook for stimulus, we are met with another lop-sided situation. The Fed has said it could increase stimulus if it were needed, but policy official after policy official has said the threshold to even ‘stop’ the Taper is very high. As the stimulus program winds down, the reality of investors accepting their own risk will become more evident. Yet, the true tipping point – for moral hazard and the dollar – will be the moment the market recognizes the first Fed rate hike is on the horizon. To help set this timetable, we have Fed Chair Yellen’s Senate testimony and a round of Fed speeches (on the economy, QE and policy guidance) this week. The British Pound went from market leader to laggard, falling for five-consecutive trading days just after setting fresh multi-year highs the week before. The coming week’s UK economic data could determine whether this is the start of a larger reversal or a minor correction within the much larger uptrend. Any surprises out of Q4 UK Gross Domestic Product growth revisions could spark important British Pound volatility. Analysts and economists polled by Bloomberg News predict that the Office of National Statistics will report the UK economy grew at 0.7 percent in Q4, consistent with the Advanced readings delivered last month. Yet there’s question whether recent positive surprises in UK economic data point to an improved figure; the British Pound would likely bounce on any positive surprises. It will otherwise be a quiet week of economic event risk out of Europe’s second-largest economy, and the GBP may need to see disappointments out of EU, Swiss, US, and Canadian GDP figures to continue onto fresh peaks. Our Senior Technical Strategist highlights the fact that the GBPUSD formed a potentially significant weekly key reversal. The fact that it has fallen so consistently after registering fresh multi-year highs warns that the exchange rate could soon turn lower. Forex trader sentiment recently matched records on the GBPUSD, and that in itself warns of a potential price extreme. The clear caveat is that major reversals are only clear in hindsight, and trying to catch major tops and bottoms is very risky. If we see the British Pound break key technical levels versus the Dollar and other counterparts, it could cement the case for selling into GBPUSD losses. Of course a break to fresh multi-year peaks would negate calls for a major reversal. Yet it’s difficult to ignore the warning signs, and it’s shaping up to be a big week for the UK currency. The Australian Dollar declined as expected last week and we continue to hold a short AUD/USD position from 0.90, looking for further weakness. As we discussed previously, the Aussie’s resilience in early February appeared to reflect a broad-based recovery in risk appetite traced out as panic linked to a range of emerging-market jitters began to subside. We expected this to allow investors to refocus on big-picture considerations. This threatened to pull the Aussie lower amid renewed erosion in risk appetite as investors considered the implications of Fed stimulus reduction against a backdrop of increasingly disappointing G10 economic news-flow. Worrisome outcomes on the data front continued to pour in last week, with a Citigroup gauge tracking the performance of G10 releases relative to expectations sinking to the lowest level in eight months. Meanwhile, rhetoric supportive of stimulus reduction emerged from a host of sources including a round-up of Fed speakers, a firm set of minutes from January’s FOMC meeting and even the draft communiqué from the weekend’s G20 meeting. While this helped end the eight-day run of consecutive gains for the S&P 500, a meaningful reversal in risk appetite failed to materialize. Rather, AUD weakness emerged from domestic catalysts as unexpectedly soft Chinese data undermined RBA policy expectations. February’s Manufacturing PMIreport from HSBC showed factory-sector activity contracted at the fastest pace in seven months. China is Australia’s largest trading partner and slowing performance there bodes ill for demand prospects in the latter country’s pivotal mining sector. This weighed against interest rate hike probabilities, with an index tracking traders’ priced-in RBA outlook edging to a two-week low. Looking ahead, a lull in significant event risk on the domestic front brings the spotlight back to macro-level catalysts and Fed policy considerations. The dynamics at work remain largely unchanged, with another busy week of “Fed-speak” including testimony from Chair Yellen likely to talk up QE cutback continuity. A variety of activity indicators from regional Fed branches as well as reports tracking housing, consumer confidence and durable goods orders are also on tap. Steady underperformance relative to median forecasts on US economic outcomes hints analysts continue to underestimate the severity of the slowdown in the world’s largest economy, opening the door for another round of downside surprises. Where last week the toxic mix of Fed stimulus withdrawal and mounting growth concerns marked a break in sentiment’s recovery, the same dynamic this time around may tip the scales toward risk aversion, amplifying downward pressure on the Aussie. Gold prices nudged higher this week with the precious metal advancing 0.25% to trade at $1322 ahead of the New York close on Friday. Equity markets also closed higher on the week with the Dow, S&P and NASDAQ posting more than 0.55% gains across the board. One would inherently look to weakness in the greenback to account for some of the gains in gold but a closer examination sees the Dow Jones FXCM USDOLLAR index closing the week higher by 0.55%. So what gives? Since the 2013 low made on December 31st, gold prices have rallied more than 11% with weakness in the greenback and broader volatility in equity markets fueling demand into the perceived safety of the yellow metal. But the risk-off argument only goes so far. The relative strength and breathe of the advance now suggests that there may be a broader shift in the fundamental outlook for bullion as prices advanced this week alongside both the US dollar and equities. A notable increase in physical demand out of China and other EM markets have also continued to be supportive with investors stepping back in as prices rebounded off 6-month lows. The largest fundamental threat to the rally would be a more aggressive taper stance from the Federal Reserve- a scenario that would likely fuel demand into the greenback as interest rates track higher and inflation expectations soften. That said, recent softness on the data front is unlikely to prompt such a stance with housing starts, building permits and existing home sales all coming in below consensus estimates this week. The news comes on the back of a string of weaker-than-expected prints on non-farm payrolls, ISM manufacturing, retail sales and industrial production this month and brings into question the health and sustainability of the recovery. Heading into next week, traders will be eying more comprehensive housing data with the S&P / Case-Shiller home price index, new home sales and pending home sales on tap. Highlighting the economic docket will be the release of the revised 4Q GDP figures with consensus estimates calling for a downward revision to an annualized rate of 2.5% q/q from 3.2% q/q. Should the recent softness in US data persist, look for expectations of a delay in the Fed’s taper to begin taking root with such a scenario likely to be supportive of equities & gold / heavy for the dollar. From a technical standpoint, the recently rally off the December low is now vulnerable and while we anticipate higher prices in gold, we will take a neutral stance below key resistance at $1336/38. This region is defined by the 100% extension of the advance off the 2013 low and the 61.8% retracement of the decline off the August high. Also note that a longer dated trendline resistance dating back to the 2012 high comes in just ahead of $1336 and if compromised suggests a much more significant low was put in place back in December. Such a scenario eyes topside targets at $1360, $1400 and $1415. Interim support rests at $1295/99 with our broader outlook remaining weighted to the topside while above $1268/70. Weaker than expected data was reported almost everywhere. After suffering losses, can the US dollar emerge as a winner? Euro-zone inflation, Us consumer confidence, Housing data, Unemployment Claims and GDP data from the US, UK and Canada are among the major events on our calendar. Here is an outlook on the main market-movers this week. German Ifo Business Climate: Monday, 9:00. German business confidence soared to 110.6 in January from 109.5 in December, rising to the highest level since July 2011. The reading surpassed forecasts of 110.2, indicating German economy is expanding full steam. The Bundesbank has projected a strong expansion in 2014, after the weak final quarter of 2013 where German economy shifted from domestic demand to global trade. Another climb to 110.7 is expected this time. US CB Consumer Confidence: Tuesday, 15:00. Consumers sentiment unexpectedly edged up in January to 80.7 from 77.5 in December, reaching a five-month high amid renewed optimism about the economy and labor market. Economists expected a weaker reading of 78.3. US jobs market improved offering plentiful positions and higher wages propelling consumer purchases and confidence. A small decline to 80.2 is forecasted. UK Second Estimate GDP: Wednesday, 9:30. The first release of UK GDP showed a growth rate of 0.7% in Q4 2013, which is quite solid growth. A confirmation of this figure is expected in the second release. According to NIESR monthly estimates, GDP has increased by 0.8% in the three months ending in January 2014. The Bank of England is expected to keep interest rates on hold until the second quarter of 2015 and annual GDP growth will reach 2.5% in 2014 and 2.1% in 2015. US New Home Sales: Wednesday, 15:00. The annual number of new home sales disappointed for the second consecutive month with a seasonally adjusted annual rate of 414,000 units, much weaker than the 445,000-unit pace registered in November missing predictions for a rise to 457,000. Many blamed the harsh winter conditions for the ongoing fall in the housing sector with a 36.4% fall in the Northeast which was hit by cold temperatures. This fall is not consistent with the strong demand reflected in the declining inventory for new and existing homes, indicating this is only a temporary setback. Another drop to 406,000 is expected now. US Durable Goods Orders: Thursday, 13:30. Orders for long-lasting U.S. manufactured goods excluding transportation items plunged unexpectedly in December by 1.6% after a 1.2% gain in the previous month posting the biggest decline since March 2013. Most orders were weak, with the exception for machinery, and electrical equipment, appliances and components rising. Durable goods orders fell 4.3% in December after a 3.4% climb in November, pulled down by weak demand for transportation equipment, primary metals, computers and electronic products and capital goods. Durable Goods Orders are expected to decline 0.7% while core Durable Goods Orders are expected to fall 0.1%. US Unemployment Claims: Thursday, 13:30. The number Americans filing applications for unemployment benefits dropped by 3,000 last week, to a seasonally adjusted 336,000, indicating firing has not increased. The number of applicants became stable in recent weeks despite modest levels of hiring in January and February, signaling business confidence is improving. In recent months, frigid weather slowed down hiring, retail sales and home construction. Job growth for the past two months reached only a half the monthly average for the previous two years. However lower unemployment rate of 6.6% was an improvement from December. Another drop to 333,000 is anticipated now. Euro-zone Flash CPI: Friday, 10:00. As the focus of the ECB shifted to inflation (or the lack of it), the importance of CPI has risen. The surprising drop in inflation in October triggered a rate cut in November. Year over year CPI is expected to remain unchanged at 0.7%. However, a strong euro and a fragile recovery could result in a new low for CPI and perhaps for core CPI, which also bottomed out at 0.7% so far. A drop to new cycle lows could trigger a negative deposit rate from the ECB in March. Canadian GDP: Friday, 13:30. The Canadian economy expanded by 0.2% in November, in line with market forecast, rising for the fifth straight month amid a recovery in the oil industry outpaced a decline in manufacturing. This increase was preceded by a 0.3% increase in both September and October. Oil and gas extraction rose 2.6%, after a 0.7% decline in October, and mining and quarrying increased by 1.3%. Overall manufacturing output climbed 0.4% while the service sector increased by 0.2%. Canadian economy is expected to contract 0.2% this time. US GDP: Friday, 13:30. According to the first release, the US economy grew by 3.2% in Q4 2013. Already at that release, there were worries about the quality of this growth, with an inventory buildup taking a large part in that growth. After a few weak figures, expectations are for a downgrade of growth to 2.6% at the second and not final release. US Pending Home Sales: Friday, 15:00. The number of contracts to purchase previously owned homes in the U.S. plunged in December by 8.7% following a 0.3% decline in the preceding month. This was the worst reading since May 2010 amid higher borrowing costs and bad weather conditions halting sales. Analysts expected a modest drop of 0.3%, but unusually cold weather discouraged potential buyers. A rise of 2.9% is forecasted. Mark Carney speaks: Friday, 15:30. BOE Governor Mark Carney will speak in Frankfurt on Central Bankers. Earlier this month Carney said there is a need to change the compensation structures so that banks could see whether employees had taken undue risks or behaved badly and that compensation of bankers should be withheld and deferred for a very long time. These comments were made after news that Barclays was paying bigger bonuses despite announcing plans to cut staff in response to a fall in profits. Carney may also refer to the developments in the housing market and the means to prevent a bubble from developing. Any comment on the interest rate will be closely scrutinized after Carney hinted a hike in Q2 2015. - Retail crowd positioning warns of an extreme (and potential top) in the Euro. - EURUSD only vulnerable to a bigger correction under $1.3670/85. The Euro was a top performing currency for the past week, but the ‘feel’ to the market wasn’t that of optimism surrounding the Euro. Instead, the Euro seemingly settled at the top of the pile as a result of weakness elsewhere, rather than intrinsic strength: the Australian and New Zealand Dollars were hit by weak Chinese data; the British Pound by underwhelming inflation and retail sales figures; and the US Dollar by continued divergence by the actual state of the US economy and the Federal Reserve’s hopeful path. Yet as these issues crop up else allowing the Euro to showcase its resiliency, it’s impossible to ignore the potential for weakness ahead given the market’s obsession with Euro-Zone inflation figures. With secondary and tertiary data (PMIs, ZEW Surveys, IFO Surveys) suggesting that any economic rebound seen in the Euro-Zone is expected to continue at a positive, albeit slow pace, threats of policy action to ward off the appearance of impending deflation is the only major threat to the Euro at present time. This week, several data points on inflation in the broader Euro-Zone as well as its largest economy, Germany, will be released. On Monday, we’ll have the final January Consumer Price Index figures for the Euro-Zone, and the tone for the Euro could immediately turn sour for the ensuing days. Near-term deflation is evidently existent, with the monthly reading due at -1.1%, although the yearly is expected to maintain its post-2008 crisis low of +0.7%. Inflation data out of the Euro-Zone will remain mixed at best on the week, with the final CPI Estimate for January (due on Monday) and the initial February estimate (due on Friday) expected to show only muted inflation forecasts going forward. The January figure at +0.8% (y/y) would mark progress but for the fact that the consensus for the February release is for +0.7% (y/y), what would be a step backwards. It is inherently necessary that the Euro weather the incoming storm of potential dovish policy-inspiring data as conditions for the Euro may have started to erode. The Citi Economic Surprise Index dropped to 1.8 on Friday from 15.0 the week prior and 25.3 a month earlier; what this means is that economic momentum is starting to taper off for the Euro. Although Italian and Spanish bond yields remain low (Italian 10YY at 3.595% on Friday, Spanish 10YY at 3.541%), banking stresses are inching up with the interbank lending rate (EONIA) up to 0.171%, above its 20-day rolling-average of 0.156%. The stage is set for the Euro’s resiliency in 2014 to take a dent. With the ECB set to meet the following week on March 6, it is inevitable that any weakness in inflation data between now and then will stoke speculation over purported dovish policy action. Yet with signs of growth starting to emerge and financial crisis conditions absent, we maintain that a BoE-styled Funding for Lending Scheme (FLS) has become more appealing for the ECB as it could address credit concerns without putting the Euro at risk of a massive ECB balance sheet expansion that another LTRO or a Fed-styled QE would bring. The dollar was lower against the euro on Friday, following the release of poor U.S. housing data, but ended the week higher against the yen and most other major currencies. The euro zone is to release revised data on consumer price inflation, while the Ifo Institute is to publish a report on German business climate. New Zealand is to produce data on inflation expectations. The U.K. is to release private sector reports on mortgage approvals and retail sales. The European Commission is to publish its economic forecasts for European Union member states. The U.S. is to release data on consumer confidence and a private sector report on house price inflation. Australia is to publish data on completed construction work. In the euro zone, Germany is to release a report on Gfk consumer climate. The U.K. is to publish revised data on fourth quarter economic growth, as well as preliminary data on business investment. The U.S. is to release data on new home sales, a leading indicator of demand in the housing market. Later Wednesday, New Zealand is to release a report on the trade balance. Australia is to release data on private capital expenditure. Switzerland is to publish data on fourth quarter gross domestic product, the broadest indicator of economic activity and the leading measure of the economy’s health. The country is also to release data on the change in the number of people employed in the previous quarter. In the euro zone, Germany is to publish preliminary data on consumer inflation, as well as data on the change in the number of people unemployed. Canada is to produce data on the current account. Also Thursday, the U.S. is to release data on durable goods orders, a leading indicator of production, and the weekly report on initial jobless claims. Japan is to release a series of data, including reports on household spending, retail sales, inflation, and industrial production. New Zealand is to release data on business confidence, while Australia is to produce a report on private sector credit. The euro zone is to release preliminary data on consumer inflation and a separate report on the unemployment rate across the currency bloc. Germany is to publish data on retail sales. The U.S. is to round up the week with revised data on fourth quarter growth, a report on manufacturing activity in the Chicago region, revised data on consumer sentiment and private sector data on pending home sales. The dollar ended the week higher against the yen on Friday amid expectations that the Federal Reserve will continue to reduce stimulus, while the Bank of Japan sticks to its quantitative easing program. The U.S. is to release data on durable goods orders, a leading indicator of production, and the weekly report on initial jobless claims. The dollar ended the week lower against the Swiss franc on Friday as weaker-than-expected U.S. housing data added to concerns that the economic recovery is losing momentum. The Canadian dollar ended the week lower against the U.S. dollar on Friday, following the release of weaker-than-expected domestic data on retail sales and tame inflation data. Canada is to publish the monthly report on GDP growth, the broadest indicator of economic activity and the leading measure of the economy’s health.